It's been thirteen years since I was last in the Arctic -- in person -- though in spirit, I've never really left. 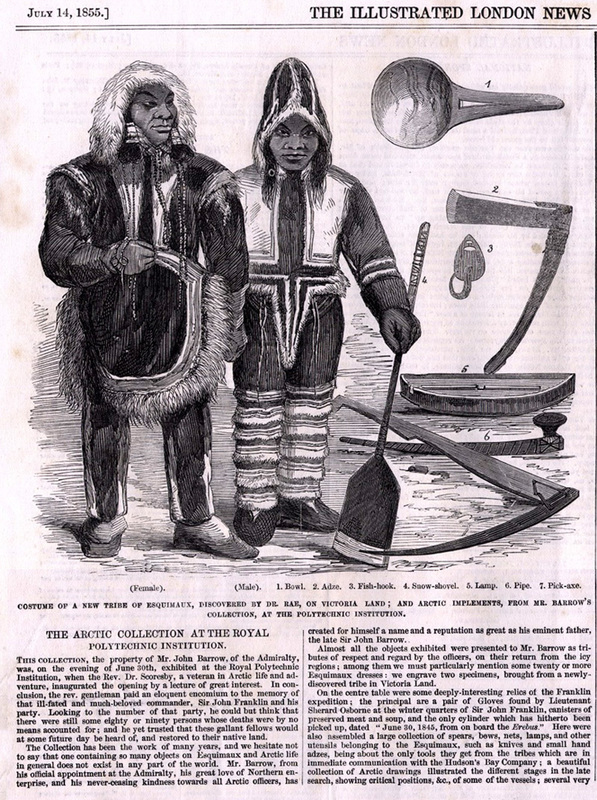 Over those years I've published two books -- Arctic Spectacles and Finding Franklin -- which have drawn both from my experiences there and from research in archives around the world. I've been fortunate to make many friends among my fellow-sojourners in the North, including some who have lived there all their lives, and some who, like me, are mainly adventurers of the armchair variety. When I was last there, it was for the filming of the documentary Arctic Passage: Prisoners of the Ice, a co-production of WGBH's acclaimed NOVA program and ITN Factual, the documentary division of Britain's Channel 4, which offered what was then state-of-the-art knowledge on the story of the lost Franklin expedition. We filmed at the Franklin graves at Beechey Island, on the cliffs overlooking the hamlet of Resolute, on the ice of Resolute Bay, and in and around Gjoa Haven on King William Island. We traveled almost entirely by air -- small commercial planes, and, for the trip to Beechey, a chartered helicopter. I'm very proud of the film that we made, although of course a great deal has changed since then: both of Franklin's ships have been found, and extensive new archaeological work on the ground has advanced what we know of the movement of Franklin's men on land. And yet, as with any mystery of this size, so long searched for and scrutinized, even today we have more than our share of "known unknowns." Were the ships piloted? How widespread was the cannibalism that's been attested to at Erebus Bay? And of course, above all -- if one is inclined toward the more Romantic aspects of the story -- where is the grave of Sir John Franklin himself? This time, though, I won't be participating in a film; instead, I'll be lecturing aboard a series of voyages, both from the comfort of shipboard conference rooms, and on some of the sites on land which have been made famous by the exploits of nineteenth-century explorers. I'll be back at Beechey, of course -- but also at Fury Beach, where the Parry expedition's ship HMS "Fury" ran aground and was abandoned, and from whose stores, a decade later, Sir John and James Clark Ross made sustainance enough to reach an unlikely rescue. I'll be at Fort Ross, at the entrance to the fabled Bellot Strait, whose first post-manager, L.A. Learmonth, was a veteran Franklin searcher. I hope also to stand on or near Victory Point, James Clark Ross's furthest, and the site of the last known written record of Franklin's men. And, I hope, I'll be able to pass near the sites of both of Franklin's fabled vessels, the Erebus and the Terror (one can't get too close, as they are now in protected areas). And this time, going by ship, I'll have a perspective much closer to that of Franklin and his men. Even for a modern vessel, these waters are not without hazards; even with GPS and modern safety equipment, a landing on shore and visit to an historical site require considerable caution, planning, and permitting -- and a polar bear may always decide to investigate the invaders. I'll also be drawing from a different tradition than that of documentary film -- that of the public lecture. In the decades during and immediately after the search for Franklin and the discovery of the final record at Victory Point, there were many who gave public lectures on what was known -- or unknown -- about the fate of Franklin. The speakers included many leading lights of the day, among them: William Scoresby, Leicester Silk Buckingham, Charles Francis Hall, and William Bradford. These noted figures, however, did not have the enviable platform of an icebound ship, though they could always -- as did Dickens's friend Henry Morley -- board a phantom ship in their imaginations. For myself, as a speaker and (mostly) imaginary sojourner, I feel I'll be in good company, and have no doubt of my capacity to inform and amuse. And yet, as a voyager, I'm as much a greenhorn as any passenger. I do also have a couple of tools my predecsssors lacked: this blog, and my Twitter account. As time and technology allow, I hope to be able to post periodic bulletins, along with some photographs and other materials from my voyages. I invite my readers here, who have followed me these last eight years, to come along with me on these latest adventures. Oh, Dr. Russell, I wish I was going along! For sure, I will be following very closely what you write about this trip. Way back in my much younger days, I used to dream of exploring the Arctic. Now, in my older years, I do enjoy very much what you tell armchair explorers like myself. Sounds like a great time. I will have to follow it from home however, but am looking forward to the updates and bulletins. I can imagine the pensive moments of standing at Victory Point or even in the proximity of the wrecks. When does your arctic journey take place Russell? I'll be up there from August 5th through September 4th. Have a good voyage! I'm sure we all look forward to reading excerpts from your logbook and seeing the daguerreotypes. My father and I would dearly love to find a way to track down the bones of our ancestor, Thomas Armitage (my father's great great grandfather), whose body we believe was discovered carrying his friend's possessions (Harry Peglar). Though the body was noted in records, we cannot find any evidence of whether it was left there or brought back to civilisation. Dear Andrew and Nigel -- I'm thrilled to hear from descendants of Mr. Armitage -- I am up in the Arctic now with limited shipboard e-mail access, but please do let me know how I may contact you. As to the disposition of the skeleton, I believe it was removed in the course of a Canadian military exercise in the 1970's and have been endeavoring to find its present location. Hoping to be in touch, and will send more once I land back south on September 4th! Sir John Franklin's Arctic Medal?